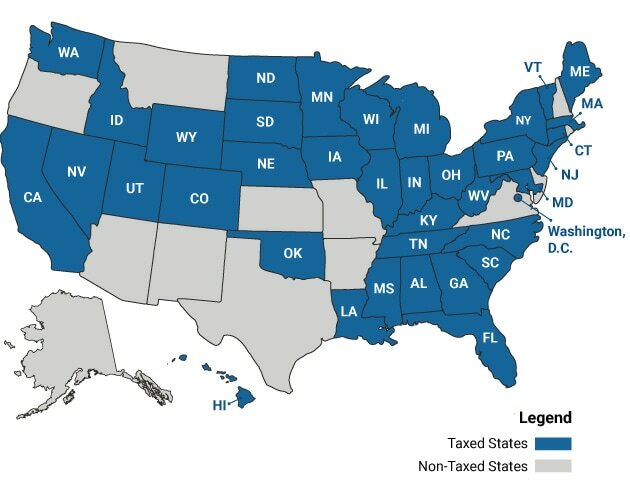 Taxed States: Alabama, California, Colorado, Connecticut, Florida, Georgia, Hawaii, Idaho, Illinois, Indiana, Iowa, Kentucky, Louisiana, Maine, Maryland, Massachusetts, Michigan, Minnesota, Mississippi, Nebraska, Nevada, New Jersey, New York, North Carolina, North Dakota, Ohio, Oklahoma, Pennsylvania, South Carolina, South Dakota, Tennessee, Utah, Vermont, Washington, Washington, D.C., West Virginia, Wisconsin, and Wyoming. We are not obligated to, and do not, collect sales or use taxes in all states. However, you may be required to report or claim non-taxed purchases on your state tax return and may also be responsible for replacement sales tax or use tax. We recommend you check with your state’s Department of Revenue for additional details. Important note for Rhode Island customers: Sales or use tax may be due on certain purchases delivered to a customer. Purchases subject to sales or use tax may require the customer to file a use tax return when sales tax is not paid at the time of purchase. Please consult your tax advisor for additional information about your responsibility to remit sales or use tax on your purchase. Many individuals or organizations qualify to make tax-exempt purchases. If your purchases qualify for exemptions and you have a valid government-issued Tax Exempt form or Resale Certificate, we can assist you. The address on the form must match either your billing or your shipping address used for your order. If sales tax has been charged on a recent order and you would like to take advantage of your tax-exempt status, please contact Customer Support at (888) 455-4682. To obtain a refund, please send a refund request to support@sumppumpsdirect.com, with your order number and tax-exempt documentation (must be provided in order to facilitate a refund for the tax on your order). If you need to place a new order and you would like to take advantage of your tax-exempt status, please contact Customer Support for assistance at (888) 455-4682 and email support@sumppumpsdirect.com a copy of your tax exemption documentation for the appropriate state you are shipping to. Sump Pumps Direct Tax.. Our Power Equipment Direct how-to library can help you learn about Proposition 65 Product Labeling, Introducing Barnes Sump Pumps and Sales Tax Information.